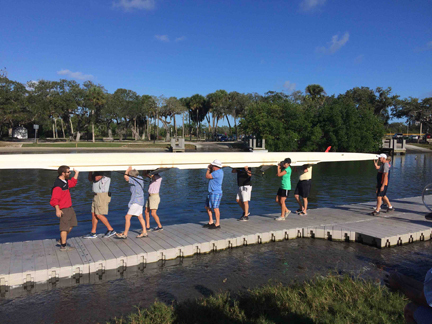 Vero Beach Rowing’s masters program is for all levels of rower. 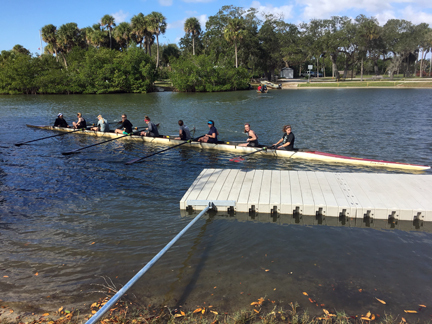 Whether it is a rower with tons of experience as a junior or collegiate rower and beyond, or just someone just getting in the boat for the 2nd time, our club is for you. As a masters member you have the opportunity to use the club’s equipment all year round and enjoy coached sessions each week. 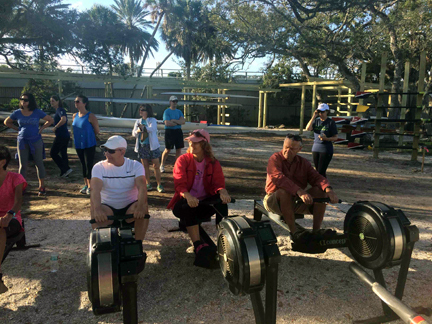 You will have the opportunity to hone in your skills on our sweep and sculling equipment, as well as stay in shape with our ergs. Our equipment ranges from stable learn to row type shells, to faster racing shells. All in all, we have a shell for you. If you have your own shell and would like to store it at our facility for you to use, we have that option as well. You can usually find one of our masters rowers out every morning, and most evenings when the weather permits. 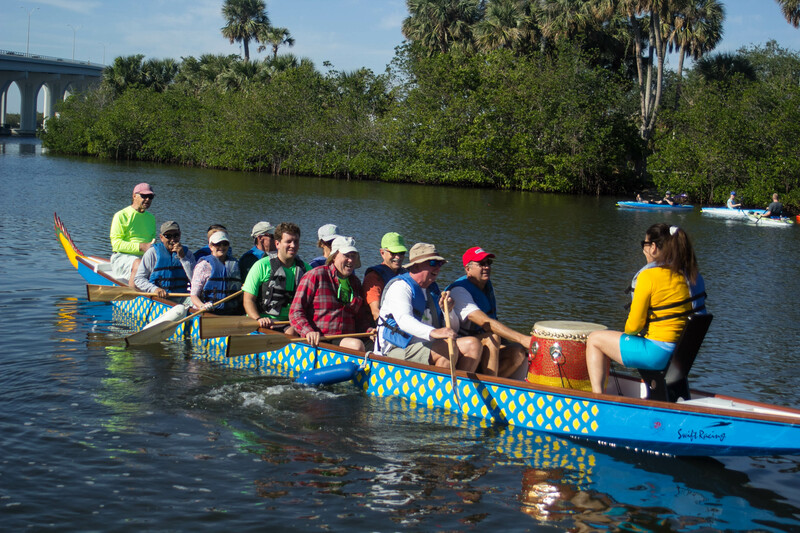 Focusing on the basics of safety, technique, timing, navigation, and “boat feel”, our next Learn to Row session runs from on April 23rd through May 16th (4 weeks). Class are held Tuesdays and Thursdays from 9:00AM to 10:30AM. Class size is limited to 14 rowers, so be sure to sign up soon as these sessions fill up fast! Class cost is $200. Fifty percent of class tuition can be applied as a credit towards the cost of an annual masters membership. Learn how to board a boat correctly! The whole body is involved in moving a shell through the water. Although rowing tends to look like an upper body sport, the strength of the rowing stroke comes from the legs. The stroke is made up of four parts: Catch, Drive, Finish and Recovery. As the stroke begins, the rower is coiled forward on the sliding seat, with knees bent and arms outstretched. At the catch, the athlete drops the oarblade vertically into the water. At the beginning of the drive, the body position doesn’t change – all the work is done by the legs. As the upper body begins to uncoil, the arms begin their work, drawing the oarblades through the water. Continuing the drive, the rowers move their hands quickly into the body, which by this time is in a slight “layback” position, requiring strong abdominal muscles. During the finish, the oar handle is moved down, drawing the oarblade out of the water. At the same time, the rower “feathers” the oar – turning the oar handle – so that the oarblade changes from a vertical position to a horizontal one. The oar remains out of the water as the rower begins recovery, moving the hands away from the body and past the knees. The body follows the hands and the sliding seat moves forward, until, knees bent, the rower is ready for the next catch. 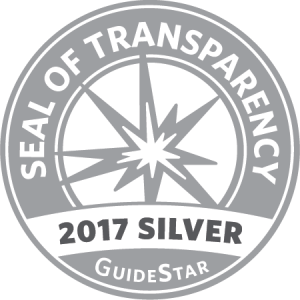 Congratulations to VBR Members Jimmy Michael and Luke Golash! 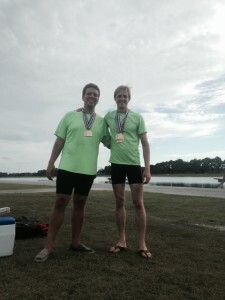 They were the First Place Men’s Double winners at the Sunshine State Games Regatta in Sarasota, Florida.